One of the biggest decisions that homeowners have to make when it comes to the care and maintenance of their house, and the appearance of the house, is what type of siding to install. Since most homeowners only have to replace the siding once or twice during the entire time that they own the home, it’s a big decision. They have to consider factors like the durability, the look, the cost of the siding when it’s installed and the amount of savings they will get over the years on energy cost and maintenance costs. They will also need to consider what type of siding is already in the home. There’s a lot for homeowners to think about, but when you look at the breakdown of vinyl siding versus aluminum siding, it’s clear that for most homeowners that vinyl is the smarter choice. Aluminum siding is made up of thin sheets of metal that can be installed on your home. There are some advantages that come from using aluminum siding, but those advantages are usually only the advantageous for a particular group of homeowners. Homeowners that live near the ocean or near areas where there is a large body of water are sometimes better off using aluminum siding because it resists water and moisture in the air. Wood siding and even some vinyl siding can swell or crack when exposed to sea air or the water laden air near a large body of water. Though, that advantage isn’t something that matters to most homeowners that don’t own oceanfront homes or homes situated on the edge of a large lake or pond. Another advantage of aluminum siding is that it’s relatively light so it’s very easy and fast to install. But that lightness can also be a disadvantage if your home is in an area that tends to be windy or if your home is in an area prone to hurricanes, tornadoes, or strong storms. This is because heavy wind gusts can knock that aluminum siding loose or knock it off the house completely. The disadvantages of using aluminum siding are what usually steer homeowners away from. For one thing, aluminum siding is often very expensive to install. If you have a large house replacing the siding with aluminum siding can be way out of your budget. And the energy cost savings that you’ll get don’t make up for the increased cost of installation for most homeowners. Another big disadvantage of using aluminum siding is that the color tends to fade pretty quickly. The color is baked onto the top of the aluminum, so when it’s exposed to the hot sun over a long period of time or exposed to a lot of wind and snow the color can fade. Because the installation isn’t easy, it can be very difficult to replace just the faded pieces of siding. It can be almost impossible to exactly match the color of the non-faded panels. Since more and more areas are seeing record high temperatures and increased exposure to the hot sun for the spring and summer months, aluminum isn’t a practical siding choice in many parts of the country. Aluminum siding dents and scratches very easily as well. So if you have a lot of trees near your house you can expect falling branches, debris, and even dirt to dent and scratch the siding which will mean that you will need to replace the siding more often. Also, aluminum siding tends to look good from far away but look bad close up. So anyone coming to the house will notice the chalky or bad looking aluminum siding when they walk up to the house. If you are planning on selling your home at some point you should take into consideration that you will probably get a higher asking price for the home if it has vinyl siding. Vinyl siding has been the most popular home siding choice among homeowners since the 1970s and it’s still the most popular choice of siding. That’s because vinyl siding has some major advantages, and thanks to modern technology it’s available in more colors and textures than ever before. When you compare the advantages of vinyl siding to aluminum siding it’s easy to see why vinyl siding is the smarter choice for homeowners everywhere. Vinyl siding is the most durable type of home siding. It will last for decades without needing any major repairs or upgrades. If you do happen to have a dented or damaged panel, it’s easy to take off the damaged panel and replace it with a new one. Since the color is fabricated into the vinyl it doesn’t fade and it’s easy to match with a new piece of vinyl. Now there are more colors available than ever before so homeowners can choose from dozens of attractive and trendy colors when they are choosing siding. Vinyl siding needs almost no maintenance. It does need to be cleaned occasionally to get rid of debris, pollen, and dirt. 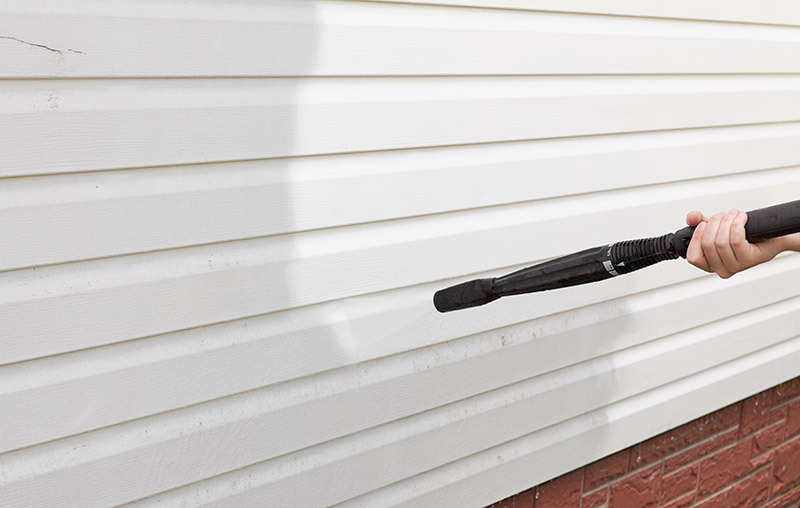 A simple and affordable professional powerwash will make that vinyl siding look brand new again. That’s really the only maintenance that needs to be done to keep vinyl siding in good condition. For durability, the best siding choice is definitely vinyl siding. Cost is the bottom line for most homeowners. And vinyl siding is the least expensive type of siding to have installed. Even though it’s the most durable and in many cases the most attractive siding option also costs less than aluminum siding to install. This is something that matters a lot to homeowners on a budget. Over time vinyl siding will also save homeowner’s money by lowering their heating and cooling costs. When you need new siding that is going to look great and last a long time, but you’re on a tight budget, vinyl siding is the ideal siding choice. Vinyl siding is the number one choice of new home builders because it’s affordable, quick to install, and it will fit into any architectural style. It doesn’t matter if your home is a small one level Craftsman or a large three-story family home vinyl siding will look great on your home. There are many new color and texture choices that can add personality and flair to the outside of your home and boost the curb appeal of your home while still making your home stand out. And vinyl siding comes in many different colors ranging from traditional dark colors to bright colors and colors that are historically accurate for specialty types of architecture. If your home is in a community where the HOA is strict about the color of exteriors you will be able to find high-quality vinyl siding that will fall within the acceptable color palette for that neighborhood. Talk with a professional today about the many benefits of vinyl siding or to find out more about the many different styles, colors, and textures of vinyl siding that are available today. When you want to protect your home and give your home a curb appeal facelift on a budget the best choice is vinyl siding. 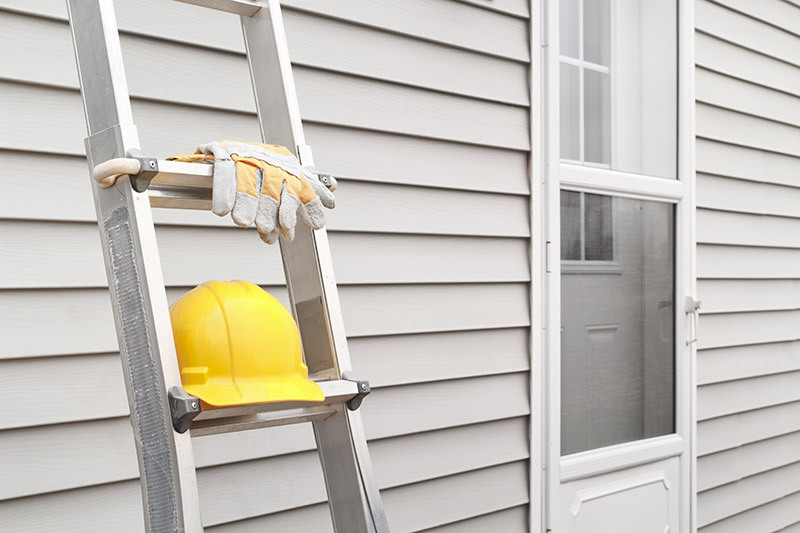 Get a professional home improvement company to replace your siding. Over 350,000 homeowners across the Midwest made their decision to go with Feldco because we have great products and prices. Feldco’s vinyl siding is designed to withstand extreme temperatures and weather conditions. Speak to a product specialist and get a free quote today!